‘The Young and the Restless’ Spoilers: Adam’s Death And Sully Paternity Drama Bring Chelsea And Nick Closer – Romance In The Future? Over the last few weeks on “The Young and the Restless” we have seen Chelsea Newman (Melissa Egan) and Nick Newman (Joshua Morrow) growing awfully close. Could this mean a future romance for the two? According to ABC Soaps In Depth magazine “Egan admits that she loves the possibility of a romance between the two characters because they have never had that kind of relationship.” She adds “After a respectful mourning period.” So how long do you Y&R fans think the writers should wait before putting her with someone else? Nick and Chelsea have both lost their spouses, so it’s no surprise to us fans that the writers have now brought them to be so close and we all knew where this was heading, but will they take it in that direction? A lot of rumors have been floating around that Adam Newman (Justin Hartley) is alive and we will be seeing him again during February Sweeps, but right now this is only a rumor and nothing has been confirmed. So fans think if that does happen that the writers are going to put Chelsea with Nick and Adam come home to learn that his wife has moved on with his brother. Not saying this is going to happen but it is a good theory though. Anything is possible on the soaps! We all know that Chelsea is still holding onto the secret about Adam switching the paternity test and that Christian actually belongs to him. So when that secret comes out it could possibly cause tension between Nick and Chelsea. It would be better if she just comes out and tells Nick sooner rather then later. Although, Adam would probably want him to be the one raising Christian since he did want him to be there and help with Conner. So Y&R fans stay tuned to “The Young and the Restless” to see what the future holds for Chelsea and Nick. 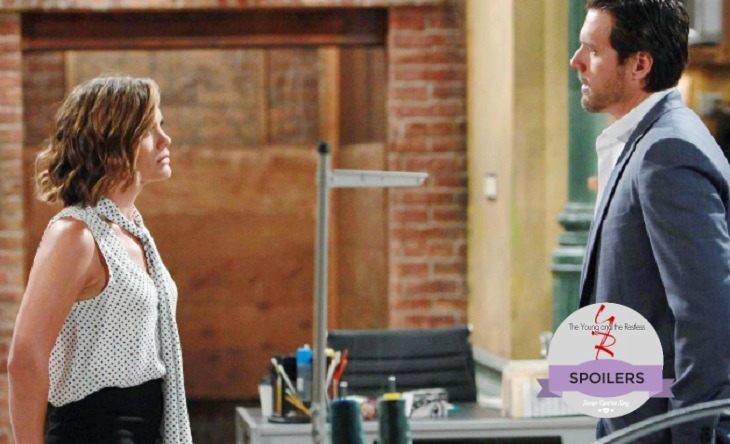 Don’t forget to check often with Soap Opera Spy for all your latest Young and Restless spoilers, news, updates, and more. Next On The Young & The Restless! Vote In Our Y&R Polls! ‘The Young and the Restless’ POLL: Who Will Reveal Christian Is Not Nick’s Son? VOTE!